15/0 Delica Beads - Bello Modo - Your Online Source for Beads, Seed Beads, Swarovski Crystal, Findings, Tools and So Much More! So tiny! But such nice large holes to work with, these are keepers! Packaged in 2x2" bags holding approx. 5 grams. According to Miyuki there are about 350 beads per gram so a bag holds an amazing 1750 beads, more or less. MIYUKI has launched this bead size, 15/0 which is smaller than DB 11/0 named "Delica precision cut 15/0 (DBS)". This new bead size is very fine and uniformly shaped, making for more beautiful, artistic, and sophisticated finished pieces. 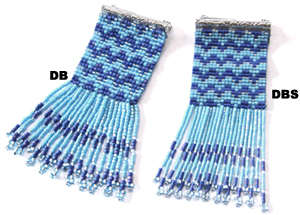 Fringes which were made with the new DBS swing smoothly just like a silk thread.